Cylinder head installed between cylinder liners and rocker arm cover. It connects intake and exhaust manifold, through expansion bellows. The components of cylinder head are Intake and Exhaust valves, Fuel injector, Safety valves, starting air valve etc. Cylinder head also facilitates completing different systems of power plant. 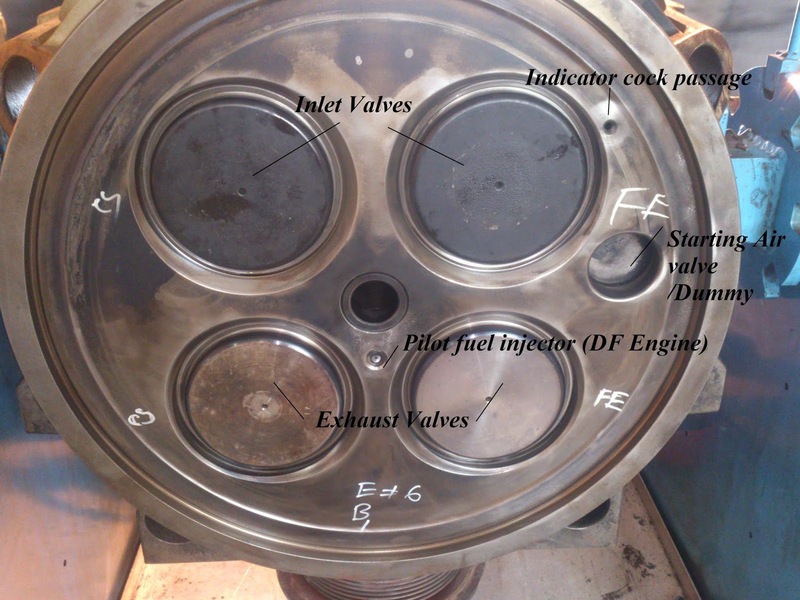 Fuel System: Fuel oil through fuel injection valve injected into the combustion chamber. Nozzle cooling Water: To cool down fuel injection nozzle. Lubrication Oil System: To lubricate rotocap bearing or axial thrust bearing. 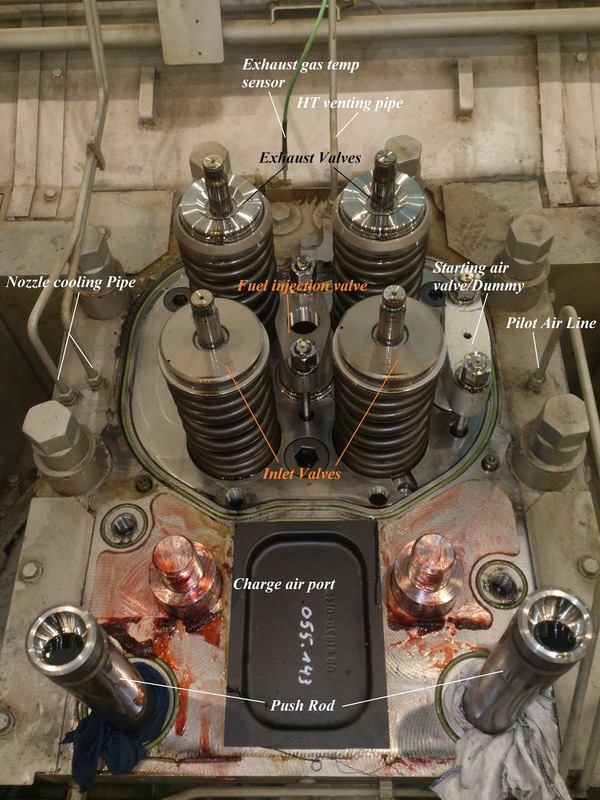 Starting Air System: Starting air and pilot airline connected with cylinder head. Intake air system: Charge air from the charge air manifold admits into the combustion chamber through the cylinder head. Exhaust Gas System: Exhaust gas due to combustion of fuel evacuates from combustion chamber to exhaust gas manifold through the cylinder head. Most common materials used to cast (generally casting process used) cylinder head is cast iron. Cast iron heads are inexpensive, durable, but weight is heavy. Aluminum also used to cast cylinder head. Aluminum heads are light weighted (about 50% of cast iron head), maintenance is easy, but the cost is higher and needs very careful attention during tightening studs and bolts (to avoid damage).